The Gannet opened to the public this weekend. A new addition to Finnieston’s blossoming restaurant scene, The Gannet is aiming for what it calls fine dining but without the fuss. This means a stripped back decor and the finest produce that Scotland can provide. The two chefs behind the venture are Peter McKenna and Ivan Stein who met while working at Michael Caine’s Abode restaurant. Having decided to build The Gannet, the duo spent a long time exploring the Highlands and islands in search of beautiful scallops, rare breed pork and tender venison to use in their new restaurant. The above video was shot by Room magazine. It shows the chefs cooking three of the dishes which will feature in the restaurant while talking about their suppliers. From this weekend’s menus typical starters include West Coast razor clams served with a smoked chicken wing, roast and pureed shallot and chicken juices or terrine made from a Clash Farm Saddleback porker. Main courses include a venison loin and confit served with red cabbage and pumpkin plus a red wine and port sauce while a dish of Borders lamb is accompanied by parsley potatoes, Jerusalem artichokes and an olive sauce. Amazingly, we’ve managed to get all through that wee description without mentioning that Daniella Nardini is Chef Stein’s other half. Doh! On the other side of the M8, from tomorrow, One Square is celebrating Chocolate Week, which runs 14-20 October, with a specially-created chocolate afternoon tea. 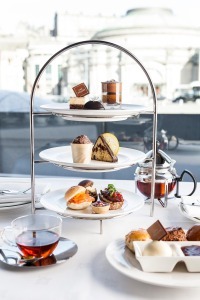 One Square’s afternoon tea, which runs throughout October and November, has been devised in association with Valrhona, the luxury French chocolate-maker. The menu is annotated with detailed chocolate tasting notes which make for esoteric reading. The chocolate baba comes with passion fruit syrup and a Manjari espuma made with pure Madagascan Manjari chocolate. As I’m sure you know, Manjari liberates acidulous notes of red fruit with a delicate finish of roasted nuts. The chocolate theme continues with the sandwiches. So Scottish smoked salmon is served with orange, chilli and white chocolate mayonnaise on a Viennoise roll. Other highlights include a scone featuring bitter Araguani chocolate. This afternoon tea is served, daily, in One Square between 2.30pm and 5.30pm from 1st October until 30th November and costs £22 per person, or £27 with a glass of Champagne.